Friday December 28th 1883 I was at home alone a good part of the day and made two comforts for Mays bed. Mother was to the neighbors and Julia to town. Otto and I went down to Holsons to spend the evening, and took Lulu Garten with us. 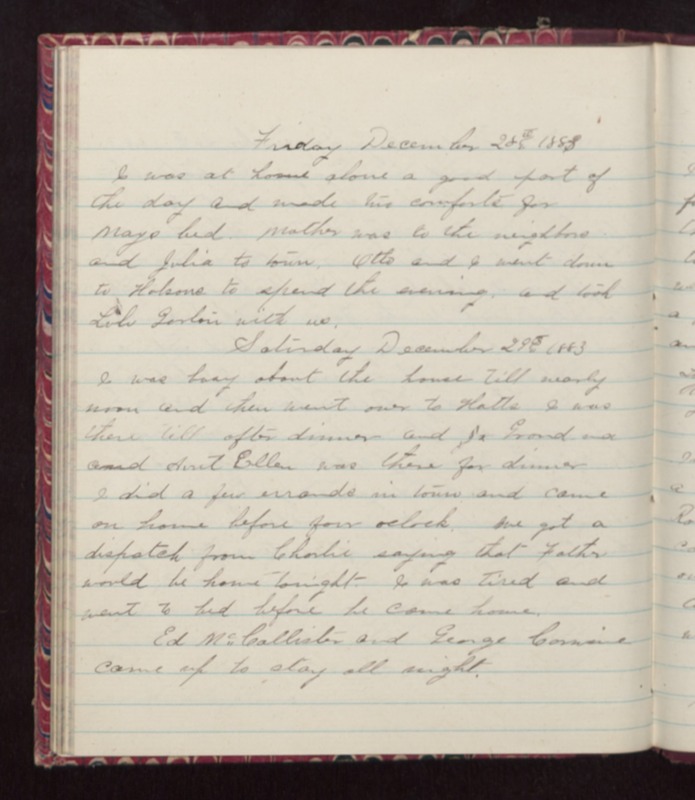 Saturday December 29th 1883 I was busy about the house till nearly noon and then went over to Hatts. I was there till after dinner and Grand-ma and Aunt Ellen was there for dinner. I did a few errands in town and came on home before four oclock. We got a dispatch from Charlie saying that Father would be home tonight. I was tired and went to bed before he came home. Ed McCallister and George Corwine came up to stay all night.